There is no day during the year when we can't find an opportunity to laugh, chuckle, guffaw, grin, or maybe just crack a smile. Without humor, the world would be a much grimmer place. Even during the High Holy Days and on fast days, most of us find a moment to share an anecdote or witty comment with friends. Tonight and tomorrow are no exception, but the overall mood of the elongated day is much more sorrowful than any other. 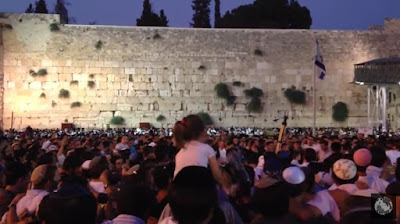 The reason, of course, is that tonight we begin the observance of Tisha B'Av, the ninth day of the Hebrew month of Av, which lasts until Tuesday night. 587 BCE (3338)- The First Temple is destroyed by the Babylonians, led by Nebuchadnezzar. The Jews are sent into what later became known as the Babylonian Exile. 70 CE (3830)- The Second Temple is destroyed by the Romans, led by Titus. 135 CE (3895) - The Romans defeat Bar Kochba's last fortress, Betar, and destroy his army. Bar Kochba himself is killed along with more than 100,000 other Jews. The Roman Emperor Hadrian turns Jerusalem into a Roman city. 1290 (5050) - King Edward I of England signs an edict expelling all Jews from England. 1492 (5252) - The Alhambra Decree takes effect, expelling the Jews from Spain and from all Spanish territories. 1914 (5674) - World War I begins when Germany declares war on Russia, setting the stage for World War II and the Holocaust. 1940 (5700) - Himmler presents his plan for the "Final Solution" to the Jewish problem to the Nazi Party. 1942 (5702) - Nazis begin deporting Jews from the Warsaw Ghetto. On Tisha B'Av, Jews gather in darkened synagogues to read Eicha (The Book of Lamentations) and reflect on the tragedies that befell our people through the millennia. So we won't post any jokes or hilarity today and tomorrow, but we'll share a couple of videos of singing at the Western Wall in Jerusalem. Today's post is a video taken at the Kotel in Jerusalem in 2015, when hundreds swayed in unison as they sang the prayer Acheinu. אַחֵינוּ כָּל בֵּית יִשְׂרָאֵל, הַנְּתוּנִים בְּצָרָה וּבַשִּׁבְיָה, הָעוֹמְדִים בֵּין בַּיָּם וּבֵין בַּיַּבָּשָׁה, הַמָּקוֹם יְרַחֵם עֲלֵיהֶם, וְיוֹצִיאֵם מִצָּרָה לִרְוָחָה, וּמֵאֲפֵלָה לְאוֹרָה, וּמִשִּׁעְבּוּד לִגְאֻלָּה, הַשְׁתָּא בַּעֲגָלָא וּבִזְמַן קָרִיב. May the All-prese​nt have mercy upon them, and bring them forth from trouble to enlargeme​nt, from darkness to light, and from subjectio​n to redemptio​n, now speedily and at a near time; and let us say, Amen. There isn't anything to like about Tisha B'Av but your Blog is so appropriate.